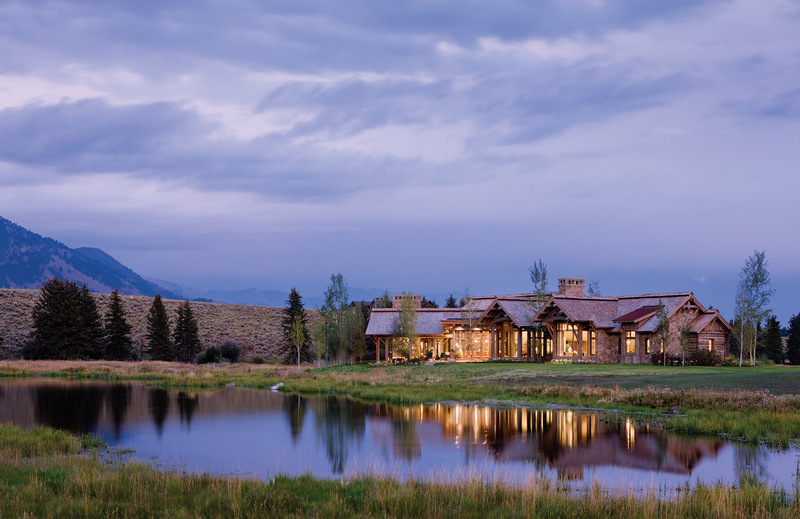 BUILDING A HOUSE IN THE HEART of Wyoming’s most dramatic landscape isn’t an easy feat. There’s a balance to it that requires a team of people to walk an invisible tightrope that spans the yaw of honoring the dynamic environs without marring its beauty. One family home, in northwestern Wyoming, represents that balance. 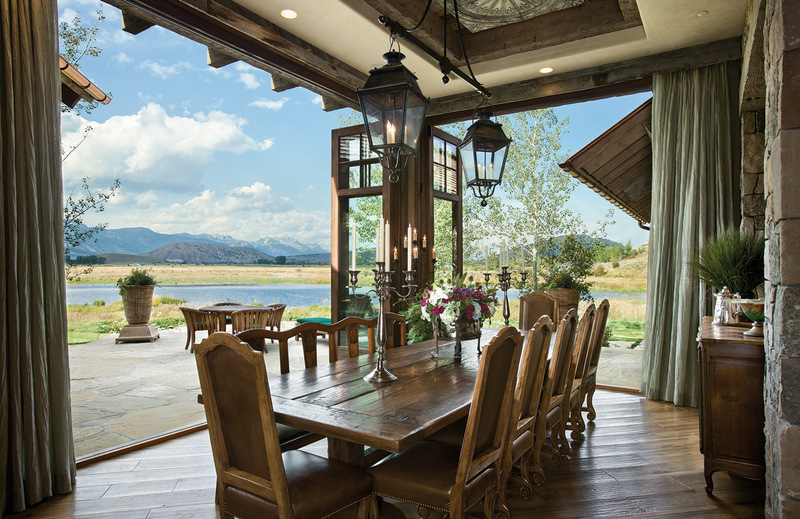 “With such spectacular views in such a unique setting, our challenge was to make the house the focal point for people, while also positioning it toward the most outstanding vista,” explained Jerry Locati, principal of Locati Architects, in Bozeman, Montana. 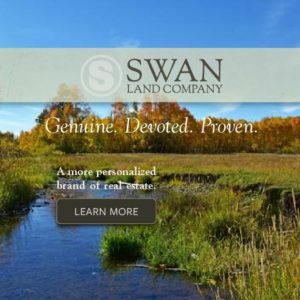 Before ground was even broken for the home, the owner requested a private trout pond be installed with the vision that it would ultimately reflect the image of the finished home. “Every detail was centered around that view, around that water and the mountains and how the home would relate to it,” said Locati. To achieve that, project architect Darin Hoekema planned the design to function with internal focus, piecing together different quadrants of living space by incorporating varied roof heights and materials over the course of 10,000-square-feet with the intention of creating the sense that a series of buildings had been collected to form a compound rather than a single rambling residence. That effect was accomplished through the experienced craftsmanship of Schlauch Bottcher Construction, also of Bozeman. As a team, they let the grandeur of the home unfold. From the moment a car turns onto the road toward the house, the mountains and sweeping open space are all-encompassing. But pull into the driveway, and the home almost blocks that view. With the front door, surrounded by prominent timbers and stone as the new focus, said Locati, a visitor has an experience of rediscovery upon walking over the threshold of the home. 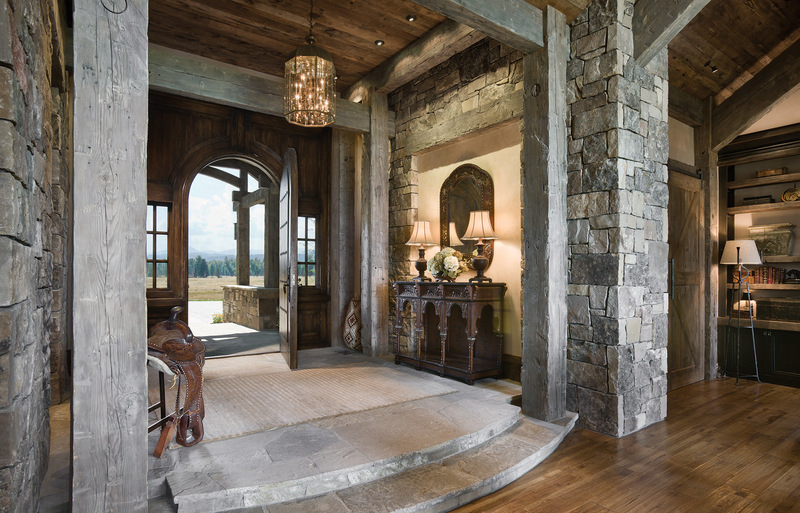 There, with distressed timbers to frame the entry, the great room and windows that look onto the pond and mountain range naturally draw the eyes outside again. Yet, once a viewer adjusts, gradually it becomes clear that inside there is so much to discover as well. “We wanted to be sensitive to the landscape and chose to paint a story by designing a complex that needs to be discovered, the architecture invites you to explore it as it unfolds,” Locati said. Another aspect of the balancing act when building in a spectacular setting is the interior design. Careful not to upstage the drama outside, Janet Baker, of North Carolina, and the lady of the house were intent on creating spaces that offer a sense of shelter and security while embracing the vastness that is outside. “We didn’t want to fight that view,” explained Baker. Essential to their approach was a color palette inside that would compliment the home’s natural setting. Baker selected natural tones that were represented in the outdoor surroundings, incorporating grays, off-white, warm browns and pale blues for color and endemic stone, rough woods, as well as metal to accent the classic Western architecture. “This is a Western home with Southern flair,” noted Baker enthusiastically. 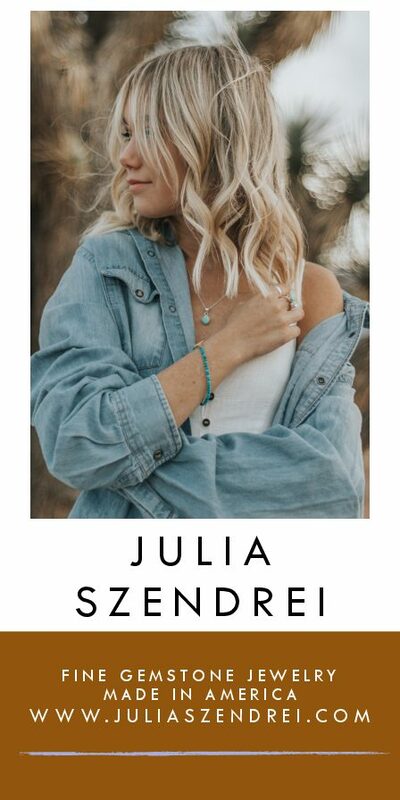 Her longstanding relationship with the homeowners started when Baker had an interior design firm in Atlanta that specialized primarily in commercial design and some select residential projects. The clients and Baker clicked over a corporate project and have since worked together on many other interior ventures, though Baker doesn’t take many commissions these days. That proclivity for collecting shows in the many antique furnishings and lighting throughout the home. Carved English furniture accents simply upholstered wingback chairs in the great room and vintage tin ceiling tiles punctuate the dining area off the kitchen. Accentuating the owners Southern hospitality, the home is welcoming and comfortable at every turn. A breezeway off the main entertaining area was utilized to showcase the couple’s art collection. 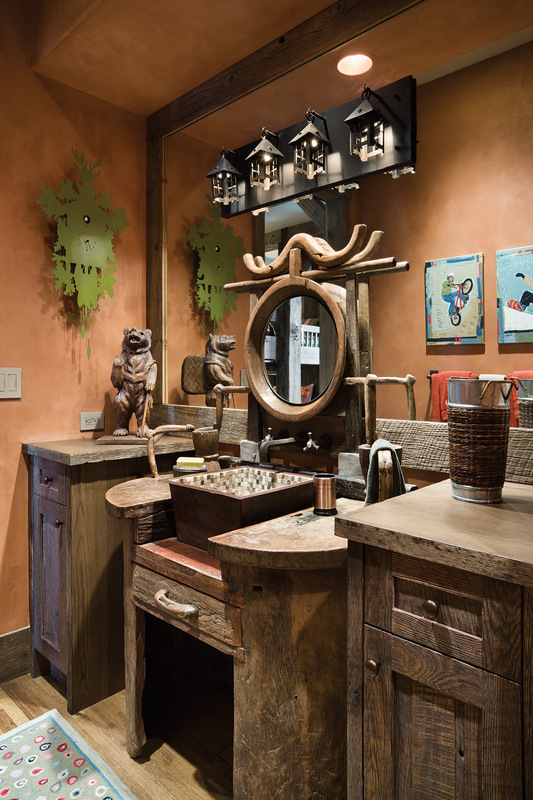 Utilizing artisans at Fry Steel and Wood Works and Reworks Design in Bozeman, Baker commissioned custom shelving that incorporated acid washed iron and reclaimed lumber to display the owners’ collection of African baskets and antique English boxes alongside notable Western art pieces. After the great room, the kitchen is command central, according to Locati. From that open space the house flows in three directions — to the adjoining family room, to the expansive outdoor living area and to the dining room. Guest bedrooms can also be accessed on this end of the house, while the master suite is on the opposite end. By design, every room in the house centers on a view outside. With gracious spaces for entertaining or cozy nooks for relaxing, the house easily absorbs the company of just two people or the swell of 50 guests. On the warm summer evenings the barriers between inside and outside are barely noticeable when the accordion glass doors in the kitchen are open wide to the fresh air, the pond and the mountains. It’s then that everything seems to be in balance. 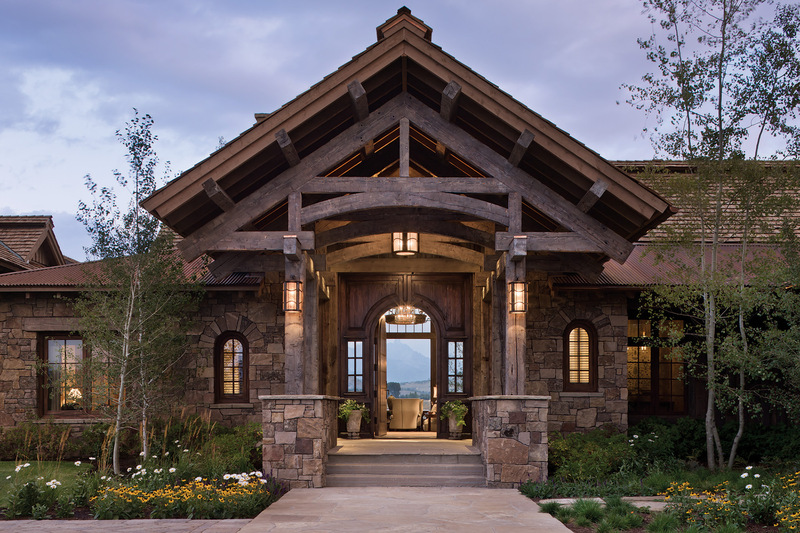 The gabled timberframe entry becomes the focal point for visitors as they enter the home, but once through the front door, the mountain vistas unfold. The owner prized the setting of the house and had a trout pond designed to reflect the expanse of the home, the mountains and sky. 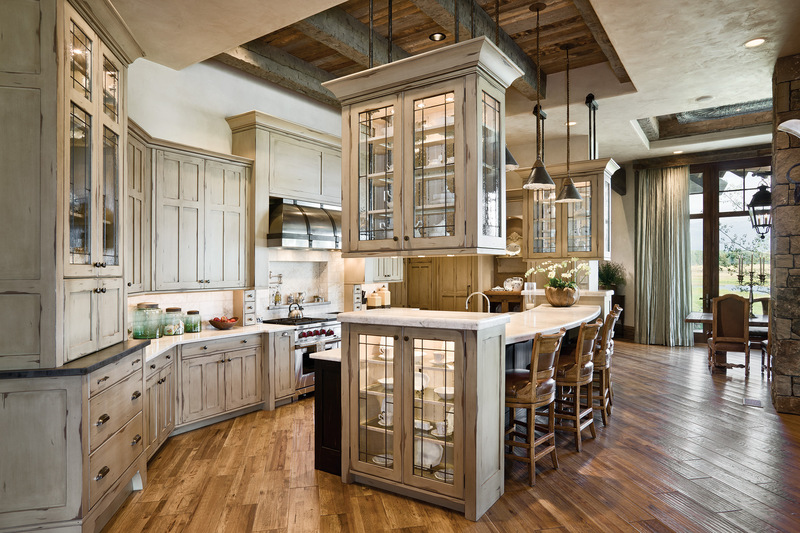 In the kitchen, the interior designer put a twist on the traditional form of the cabinetry, applying a distressed finish, but also by suspending two glass cabinets from the soffited ceiling with iron rods as a nod toward the rustic architectural elements of the home. A stainless steel hood over the stove is also strapped with iron to echo the rustic ties. The countertops are boutique quartzite and the flooring throughout the house is oak. Interior designer Janet Baker and Locati Architects worked together to create a seamless transition between inside and outside livings spaces. On beautiful evenings the doors off the dining room and kitchen area fold open to the patio. Above the dining table, antique lanterns were retrofitted to create a custom light fixture. Vintage tin ceiling tiles delineate the dining room from the open kitchen floor plan. 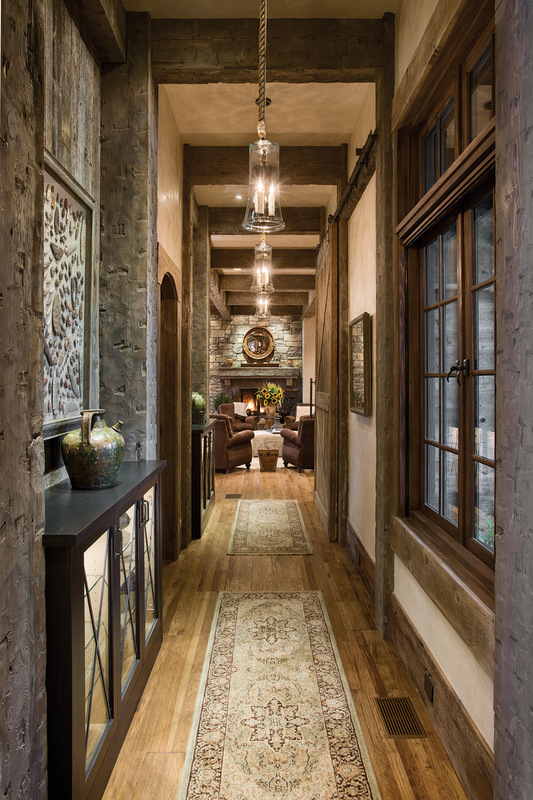 Project architect Darin Hoekema utilized a breezeway to the private bedrooms as a gallery to display the owners extensive collection of Native American artifacts and arrowheads. The guest bedroom opens to an ethereally sky-blue color on the wax-rubbed plaster walls. A curved Habersham hutch adds a lavish visual focal point to the room. Incorporating antiques and rustic details for this home was half the fun for interior designer Janet Baker and her long-time client. This powder room encompasses all the playful elements of design for the kids’ bunkroom. An elegant sweep of heather-grey stone frames the threshold, where distressed reclaimed timbers stand in contrast to an ornately carved English 1800s antique table. Rustic materials applied with a streamlined contemporary touch display a rare collection of African baskets and antique boxes from England. Russ Frye Designs and Ben Baker of Reworks in Bozeman, Montana, provided all of the reclaimed and acid wash metals for the custom-built furniture in the library. 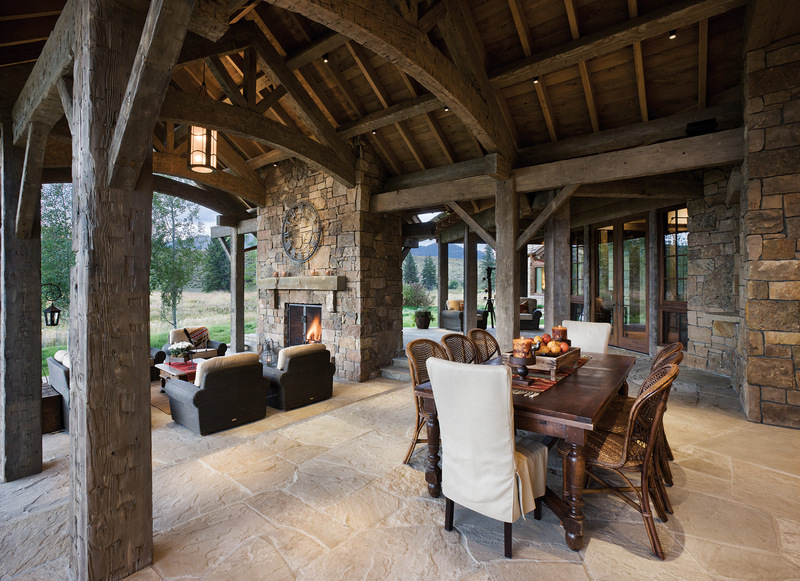 Celebrating the organic materials, stone and reclaimed lumber, the outdoor living areas are designed to be as comfortable as the interior furnishings. Slipcovers at the dining area and oversized chairs around the fireplace give the sense of indoor comfort.